It may seem strange to compare a refugee centre with Dante’s Hell. The Inferno consists of 9 circles and the outer circle is filled with pagan people — but the refugees here are mostly Muslim people with strong beliefs. In the next circle you are awaited by King Minos who will judge your sins and send you to the place in Hell you deserve, just like the Greek officials will send refugees to their places, although for them it will always be a better place to go. Young boys without parents or guardians go to the refugee centre at Agiasos, and what all refugees really want is to continue their journey to Athens, and Europe. You will find all kind of sinners in Dante’s Hell, but I don’t think all our refugees are voracious, greedy, prodigal blasphemers, crooks, schismatics, alchemists, violent people or even killers; although there are some malevolent people who do try to sneak into the country amongst genuine asylum seekers — like the Georgian murderer of the Greek actor Nikos Sergianopoulos who re-entered the country with a group of refugees to the island of Samos (after he was already expelled from Greece). These last weeks some refugees have used violence to protest being locked up for long periods in the Pagani centre. While the support action group ‘No border’ has been in Mytilini, refugees kept on protesting. There were at least seven hundred people living in the centre — which was built to house only two hundred people maximum — so the conditions, especially hygiene, were appalling. People were locked up in cages that, rather than being a modern refugee centre really were like Dante’s Hell. Last week parts of the centre were even set on fire by the refugees, to protest against their inhumane situation. So indeed it did look like a hellish inferno. Since September the authorities have tried to ameliorate the situation in Pagani by sending away large groups of people to Athens by boat. Some refugees were so keen to leave they begged doctors to pronounce them sick so that they could get a boat ticket to Athens. When the doctor refused they went beserk and attacked him. So the doctor left the refugee centre, and because they too felt threatened so did other people working there. Even the police would no longer remain inside the centre, and kept guard outside of the gates. This was really because inmates believed the police had beaten up a seventeen year old refugee boy. After months of struggle, the refugee centre has been closed down this weekend. It had become an untenable situation. However, I doubt if this is a real solution, because all new refugees now coming to the island (and they will keep coming) will be sent to another refugee centre on the neighbouring island of Chios, where I am sure, nobody will be happy to receive them, because they too have refugees arriving from Turkey. Probably in no time the centre on Chios will be just as overcrowded as Pagani on Lesvos. In most hells you will find a flaming inferno. Last Tuesday however a kind of inferno happened at sea when a small boat with seventeen refugees capsized. On board were people from Afghanistan and one Turkish ‘asylum seeker’ (he had just got out of prison and could not find work in Turkey so for a good sum of money he smuggled the refugees group to Greece, thinking afterwards he could find himself a job in Greece). 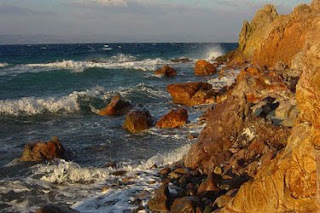 The boat hit rocks just near the little port of Skala Sykaminia, and three women and five children drowned. One boy of 14 lost his mother and two brothers. A man already living in Germany who thought this ‘illegal’ route would be a quicker way to have his wife and child join him, rather than spending of time and trying to get them accepted the ‘legal, lost both of them. It is not known whether the husband of another woman who drowned with her two children (according to the papers) has survived or is missing. People only make such dangerous journeys if they really want to escape a hell: Afghanistan, Pakistan, Palestine, Sudan and many such countries where the lives of people are persecuted and hounded by ruthless people craving power. It is those people, of course, who should be cast into the deepest point of Dante’s Hell: Cocytus, the frozen lake where traitors must remain for all eternity.